In 1991 and 1992 I worked on a summer camp for children with a learning disability in rural Pennsylvania. I’ll share more stories from my time there at a later date but this is the kind of tale that helps you build character and understand what makes different people tick. We worked six days a week at camp – on the seventh we had a day of leisure and whilst most weeks we relaxed around the camp, on occasion a couple of us ventured out to explore what small town America had to offer. Honesdale is the archetypal ‘one hoss’ town about 30 miles from Scranton (whose own claim to fame is that the airport was featured in the Macauley Culkin classic Home Alone). This was cliched America with Main Street running through its heart. After exploring a few stores my colleague Geoff and I headed into a bar about half way along Main Street – I can’t recall its name or have even been able to find if it still exists but it was a pleasant enough place to refresh ourselves with a crisp lager. At the bar we got talking to a rather elderly gent; he was in his seventies and had moved over from Scotland to work in the local mines when he was in his early twenties and they were still operating. What really made me chuckle was that I found it quite difficult to understand him. Not that he was bladdered by noon but because he still possessed one of the thickest Glaswegian accents I have ever come across, despite having claimed that he had never been back in the intervening years. This guy was like Rab C Nesbitt on steroids…but he isn’t the Frank of this story. 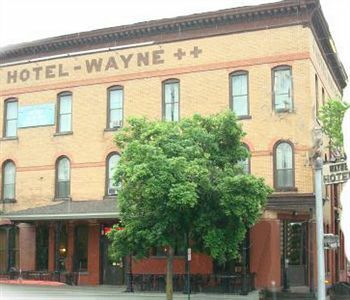 According to local press reports the Hotel Wayne is reportedly haunted and has featured on an american programme similar to those fronted by the legendary(?) Yvette Fielding and Derek Acorah in the UK – I can understand why. The Hotel Wayne is at the far north of Main Street and when we entered, we were the only ones in the bar area. Sure enough there was a pool table right near the entrance which was 25c per game and so we ordered a couple of Coors and started to play. After an uneventful first frame that I lost we began a second when into the bar walked Frank. Looking like a wispy mustachioed hero of an 1970s adult movie (picture Robin Askwith with a bit of Tom Selleck respledent in a blue and red lumberjack shirt) he simply nodded before placing half a dozen quarters on the side of the table. For those not au fait with pool etiquette, he had effectively joined the queue and obviously wanted to play for a while. We nodded back and carried on our game expecting Friend of Frank to walk through the saloon doors in the next few minutes. As I calmly potted the black, Frank applauded and suggested ‘Winner stays on?’ Why not we thought, quietly satisfied that we had made friends with a local in what was for us an alien environment. I’m sure that my jaw dropped Scooby Doo style and my cue action started to resemble that of Alex ‘Hurricane’ Higgins following one of his encounters with illicit powders. The next hour was one of the most uncomfortable I have ever encountered. What strategy should I adopt? If I let him win, my colleague and I would have to alternate playing him until the coin pile disappeared; if I beat him would I end up forever impaled into the wall of the Hotel Wayne like some kind of hunting souvenir. I have to say that the conversation was strained to say the least and the pool was of understandably of dubious quality. I lost, but lived. In fact Geoff and I both lost, deciding that discretion was the better part of valour. And then came the moment that made me think that Frank might actually be right. Just as I was about to prepare myself for another worrying frame, in walked two other guys who placed a couple of quarters on the table. Geoff and I looked at each other, finished our drinks in one and announced to Frank and the others that we had to be on our way and we had to be back on duty in an hour – completely false but said in such a believable manner. It may have simply been a terrific tactic but we started walking more quickly, and never looked back.